LOVRAN has a very long tradition as a tourist destination. From all the towns on the east side of Ucka, the coast of Liburnija, Lovran is the oldest. It has a central part which dates back to the middle age, when this part of town was surrounded by big walls and bastions. Good climate, Mediterranean vegetation and a great geographical position are the reasons that tourism has developed so fast in the beginning of 20.th century, when the Austrian noble discovered this area. Today, Lovran has a rich historical heritage, 100 years old tourist tradition, untouched nature and good infrastructure. Like in all the other tourist places in Croatia, Lovran offers a variety of accommodation: from luxurious hotels and romantic villas, to private houses and apartments, village tourism, or camp side in Medveja. Several of the apartments in Lovran are situated in old Villas from the 20 century, not all of them have been renovated, but in terms of charm and historical touch, these apartments really gives value for the money. Lovran is a fairly small city, so main activities are excursion which is organized by several agencies in the city. Some of the most popular excursion from the city: national park Brijuni, the nearby islands, Postojna pin in Slovenia, or Venice in Italy. 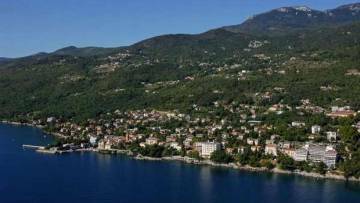 If you’re able to be in Lovran in October, try to attend "Marunada", feast of chestnuts. Also, visit the church of St. George in Lovran, build in 12th century and renovated in 15th century, and characterised by many gothic and baroque elements.